Everyone loves the baby Jesus, the Christ Child, in the manger scene. There is something endearing about the story of Mary and Joseph making the trip from Nazareth to Bethlehem only to discover that there was no room in the inn. Even the most hardened heart is touched. The crèche is not just a favourite among the children, one could consider it to be a religious kind of doll house with almost life sized figures, but it also brings out the ‘inner child’ in all of us adults. We must celebrate this good news at Christmas as well as on Good Friday and Easter. The "Passio Domini", the passion of our Lord is not limited to the three paschal days, from the passion of our Lord at the Mount of Olives until His death on the Cross. In the widest sense the Passion of the Lord really begins with the Incarnation. What the world needs to know is not just that Jesus was laid in a manger at Bethlehem, but that He was laid in a tomb outside of Jerusalem only to rise the third day as proof that His work on earth had been accepted by the Father. Our Lord chose a manger because He had to face the cross. As He would end His life by undergoing deep humiliation, so He began it. From first to last, Jesus identified with the lowliest of men, for He did not come into the world to command general admiration. Rather, He came to rescue man from sin. Each of us, without exception, is a willful sinner incapable of self-redemption. Our sin divides us from God, who is righteous, and renders us unfit to live eternally in His presence. Yet because we are His own creation, God loves us and desires to enjoy our fellowship forever, and because He loved us, He was willing to send and sacrifice His Only Begotten Son to become one of us, to die for us, in order to save us. If we have come here for the Christmas mass, hoping to catch a glimpse of the baby Jesus in the manger, have we lost sight of the one, who is nailed to the crucifix that stands before us at the altar? Do we not contemplate the infinite condescension and humiliation of the Lord, the Creator's Son, the Son of God, who did not shrink back from becoming man or from dying on the cross? Is not the search for shelter in an animal stable a way of the Cross for the LORD, who is suffering as He comes into what is his own , but his own people did not receive Him? Is Bethlehem not a Mount of Olives as well, where the Lord and in a special way, the Blessed Virgin Mary and St Joseph as well suffered an agony, as they were not able to find a lodging for the Son of God who was entrusted to them? Is the stable of Bethlehem not a Golgotha as well, where the Lord begins His life in a manger in order to yield it thirty-three years later, on another wood, the wood of the Cross? The Passion of the Lord began with the Incarnation and continues until to the last chapter of His death on the Cross. The birth and death of the Redeemer, one could say: the Manger and the Cross, are inseparable! Theologically, Christmas needs Easter, and Easter needs Christmas as we put into words our understanding of the Son of God who came amongst us and who died for us. They make sense of one another. Born in the wood of the Manger, the Lord died on another wood, the wood of the Cross - and all this is because of the sin which was committed at the wood of the tree of knowledge in the earthly Paradise. Yes, the child Jesus born this very night, was not just “Born the Son of Mary and Joseph,” “Born King of the Angelic Hosts”. No, He is so much more. He is “Born Crucified.” Let us never forget that in our revelries today. You may have noticed that this year, our manger scene seems to be competing with another major scene located in the newly refurbished sanctuary of our Church. But technically, there is no competition. This is because the manger points to the cross. Beside the manger stands his mother, the Blessed Virgin Mary, and his adopted father, St Joseph. 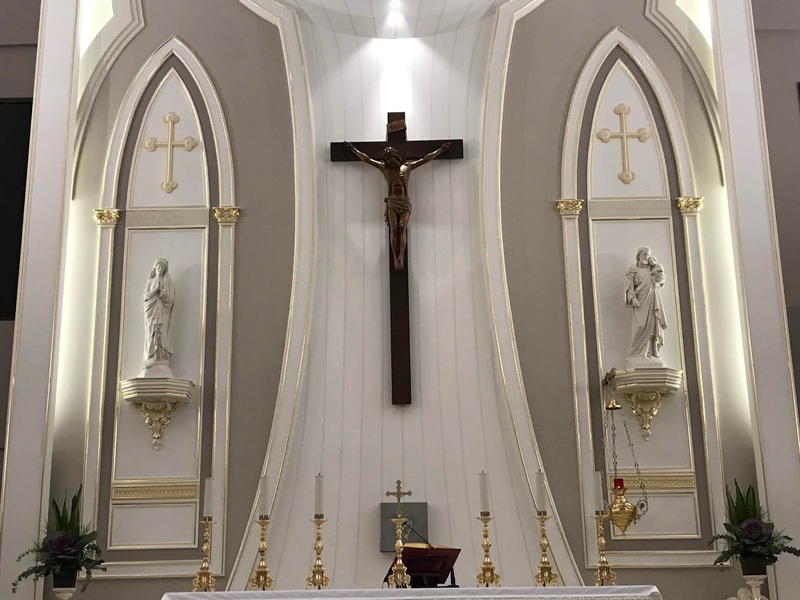 Beside our crucifix we have created two tabors or niches to contain the statues of Mother Mary and St Joseph. The position of Mary may make sense as the Fourth Gospel tells us that she was present at the foot of the cross at the time of her son’s crucifixion. But St Joseph’s presence is inexplicable. At the time of our Lord’s crucifixion, St Joseph was according to tradition already dead. Why do churches traditionally depict the parents of Jesus beside the main crucifix, one on his right and the other on his left? In regards to the placement of Mary, she is on Jesus’ right hand from “his point of view” — that is, from the point of view of someone looking out from the sanctuary. This is in accordance with the Jewish tradition of having the Queen Mother sit at the right hand of the King (1 Kings 2:19). Pope St Pius X confirms this tradition in Ad Diem Illum Laetissimum by declaring “Mary sitteth at the right hand of her Son.” The left side of the church, Mary’s side, was also known as the “Gospel Side” of the church, and the connexion between Mary and the Gospel is explained by understanding that Mary is the “New Eve,” she played a pivotal role in Salvation History. St. Joseph’s presence on the right side is then seen in light of Mary’s privileged role. But the juxtaposition of these two figures flanking the Crucifix is meant to draw us back to the scene of the Incarnation, to the scene of the birth of Christ. Both the manger and the cross are connected – one marks the beginning and the other, the end of His earthly life – and to help us better visualise the connexion of these two events, we have Mary and Joseph who both stand as the principle witnesses. So, this year as you do every year, enjoy the Christmas season. Sing the carols with joy, and bless others with gifts and laughter. But don’t forget that it is not just the manger that saves us; it is not just the birth of a baby that reconciled us to God, but the death of a man, the Son of God, who came to “save His people from their sins.” Only this message, that offends so many in the world, will save the world. We can only understand the manger, when we see the Cross.